For those who don’t know, VanRail is an operating weekend held in Vancouver, British Columbia in odd-numbered years. It is a wonderful event, with full Canadian hospitality, fine layouts, and accomplished layout owners. All in all, a real delight to attend, as I did this year on September 8 through 10. There was a pre-VanRail session on September 7 at Al Frasch’s excellent N-scale BNSF layout on Whidbey Island, Washington, which I had very much looked forward to. 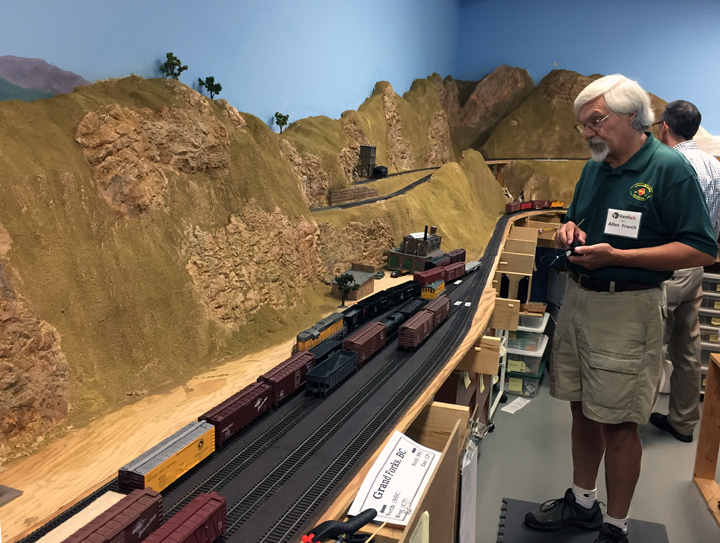 I had met Al when he operated on my layout last spring during our BayRails event, and he and I had talked about a variety of waybill and freight car routing topics. 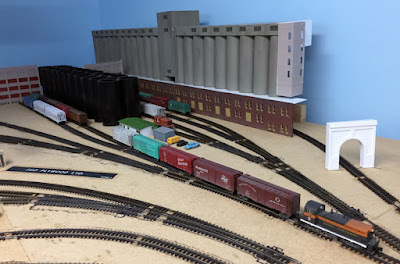 The most striking thing to me about Al’s layout was how very “industrial” his industries looked. I know, that sounds a little redundant, but I was struck by the good looks of industry after industry. I did photograph a lot of them, but will only show one instance here, Skagit Bulb Company (flower bulbs). I like that box cars are spotted inside the building, yet the reporting marks are visible outside, a “just right” design. I really like some of Al’s approaches to informing crews about how to spot cars at industries, and will be writing a future post about both Al’s method, and how I want to implement something similar on my own layout. The first Vancouver layout I operated on was Greg Madsen’s freelanced HO scale Spokane and British Columbia Railway, and as it happened, Al Frasch was on the crew. Here he is, bringing a train into Grand Forks yard (where I was working as yardmaster at the time). Behind him is Doug Lee, the third operator that day. 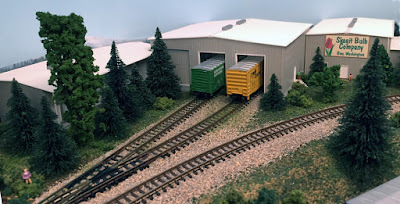 I had communicated with Greg over the years about freight car forwarding, and was intrigued to see the system he is developing for this layout. On Saturday, I had the genuine privilege to operate on Scott Calvert’s layout, the Canadian Pacific Boundary Sub in HO scale. My assignment was working at Nelson yard. Though much remains to be built on this layout, it is already strikingly good, with a very strong design concept and fine implementation so far. The photo below shows the trackage at Castlegar as it now stands. I regret not getting a better photo at Nelson, where I really enjoyed the challenge of switching the west end of the yard. 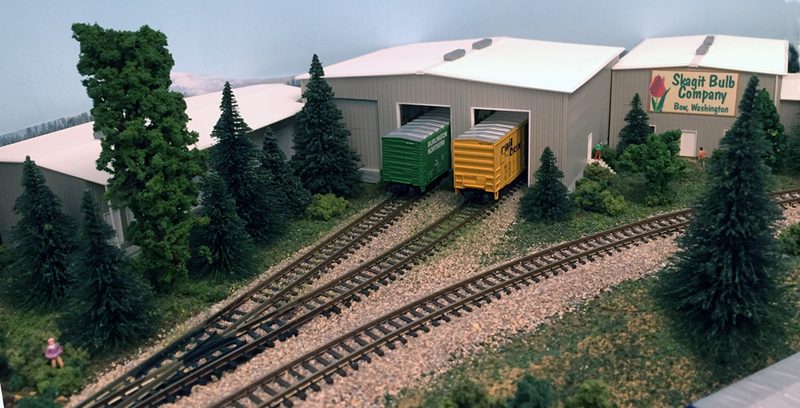 I wrapped up the weekend at Brian Morgan’s interesting N-scale layout, the Great Northern Seattle Terminal. I really liked his industries and switching assignments (all the operators essentially have switch jobs). 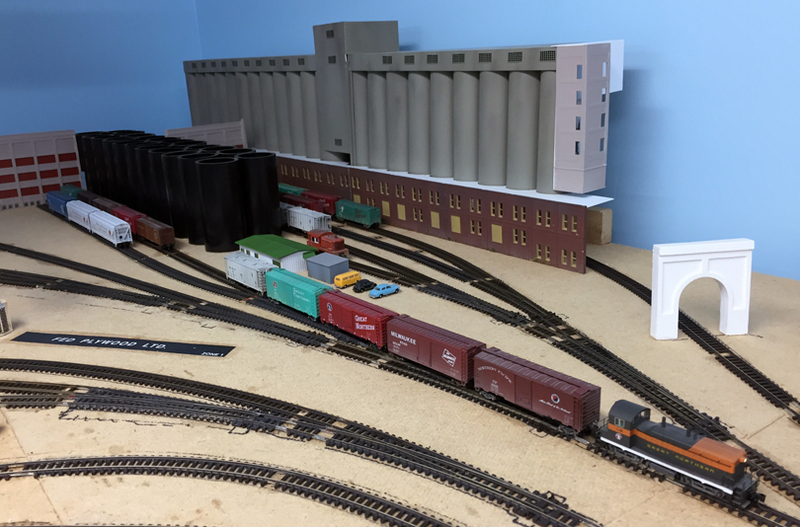 One example of the well-thought-out design is this flour mill, a very large industry with five tracks in all, three running deep behind the rows of black tanks (that’s my switcher in the foreground). Obviously one cannot see what is back in there at the mill. But Brian provided a very helpful laminated map, with car numbers written on it, as shown below. Note also the small “sticky dots” for those who would like to tag cars with original positions, so the ones not being pulled can be spotted back where they came from. I found I could use just the map to do all that, but it was nice to have two options. At the end of the session, Brian used his tripod to take a picture of the three operators and himself, as you see below. 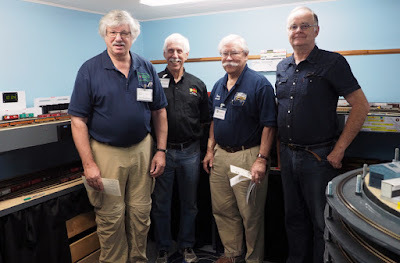 From left, we were Seth Neumann, me, Travers Stavac, and Brian. This was a great weekend. I really enjoyed the beautiful city of Vancouver and all the layouts, and was very pleased with the cordial hospitality of our Canadian hosts. I hope to attend this event in future years.